I want to share some new beauty treats I've added to my makeup collection. I love fanciful, whimsical (food themed beauty) cosmetic cases & pouches. 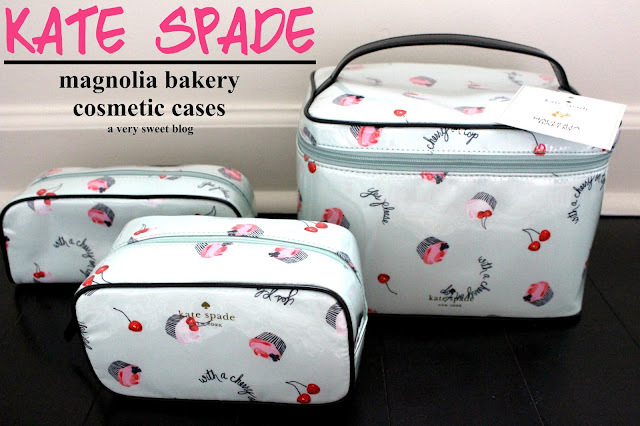 Kate Spade collaborated on a collection with world renowned Magnolia Bakery in New York City. Their treats look so delicious on their website. Has anyone tried them? Well anyway, I fell in love with these cosmetic cases. All of them are in-scripted with the words "yes, please" "with a cherry on top" and cute cherries & cupcakes on a mint green background. Every year, Anna Sui creates a Limited Edition Christmas item for ASOS. See the one from last year HERE. It's a cute little black patent leather bag with red & white hearts. Anna Sui is written in script. 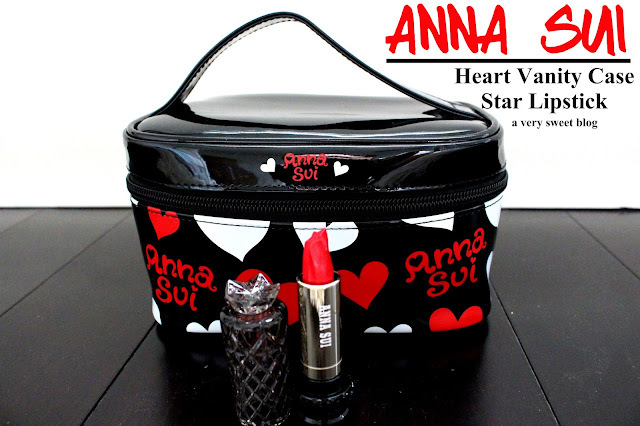 This included a true red lipstick (shaped like a star) in a classic Anna Sui lipstick casing. I plan on reviewing and swatching these Lip Kit By Kylie liquid lipstick shades really soon. They were really hard to get. I lucked up and got them the second time they went on sale. I definitely wasn't going to buy them on eBay. LOL I wish I would've scored them the first time they went on sale, because I would've been a very rich girl. One went for 10K LOL Again, I'll let you know my thoughts on these. Many of you know, I started renovating my home in 2015. I'm happy to say the kitchen, 2 bathrooms, bedroom and laundry room are complete! My makeup room is almost complete. I just need to order a mirror & chairs for it. So all that is left for 2016 is the living room, another bedroom & enclosed porch. Well anyway, I ordered some byAlegory acrylic cosmetic organizers for my makeup room. I purchased them to keep my lipsticks, lipglosses etc. in order. This is just one box, but there are many more. I hope I ordered enough. LOL I'll do a YouTube video showing my makeup room (it's small) & organization once I get everything together. These organizers are REALLY nice and of excellent quality. They also packed them really well (was worried they would break). But that was not the case :) Can't wait to show you! I'll show all of these in detail on my Snapchat later! Find me at averysweetblog! These are some cool things, Kim!! I hope we get to see the makeup room soon. Ohhmmy i want to try that lip by Kylie. magnolia bakery just arrived in hawaii, so i know who/what you're talking about! Kate Spade set is so pretty. So gorgeous. I am especially loving the Kate Spade collaboration- want that so much! The Kate Spade cases are so cute! The heart case by Anna is very cool too. I'm curious as to what you think of the liquid lip sets! Very fun post Kim! OH yes, Magnolia cupckaes are nom to the nom nom nom. those cases are CUTE!! Wow Kim you really did do a lot of work to your house. I bet it's all beautiful. Well the Kate Spade makeup bags look so nice. I can't wait to see the makeup room - how exciting!! Wishing you a wonderful week and a Happy New Year. Ooh the Anna Sui set looks adorable! The Allegory boxes look cool and I can't wait to see more! those makeup cases are too cute and go perfectly with the theme of your blog :) I've read mixed reviews on the kylie lip colors but I do like the shades from what I've seen! happy holidays Kim! Ohhh, I adore anything Anna Sui! My best friend is crazy for her makeup but I never understood the hype until I got my hands on one of her lipsticks and oh my, I am now hooked and I want to buy more of her makeup in the future. Glad to hear that the renovations are coming along good and I really look forward to seeing your makeup room once it's completed, Kim! ps: Hope you had a great Christmas celebration and a brilliant New Year, Kim! 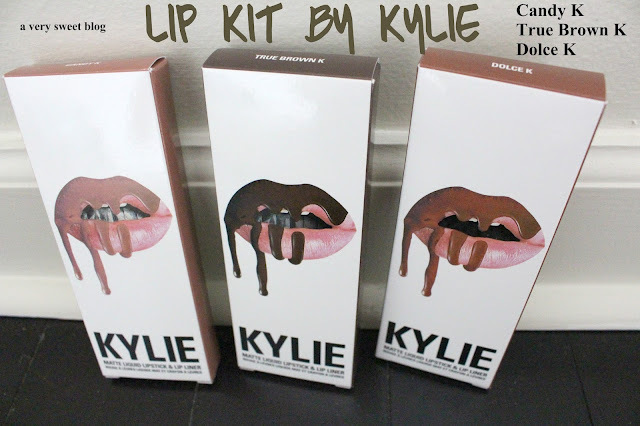 I'm shocked to hear one of Kylie's lipsticks went for 10K, that's crazy! So glad you managed to pick up yours when they went on sale for the second time - looking forward to seeing the colours on you :) I've got so much love for your gorgeous Kate Spade cosmetic cases too! I'm very excited to see that review of lip kit by Kylie...(I'm still not sure what Kardashian she is but I know she is one of the younger sisters so I'm totally clueless)....Anyway, I'm really fascinated by brown lipsticks right now. The Magnolia Bakery and Kate Spade collection is very pretty. I would like that one. PS. I love magnolias, and they are pretty amazing. Your Kate Spade cosmetic case is the cutest! And I'm interested in knowing what you think of the Lip Kit. I can't believe one sold for $10K. That's ridiculous. Nice items Kim! I think the Kate Spade cosmetic cases are so cute! I hope you had a Merry Christmas! Excited to hear about the lip kits! Looking forward to seeing your renovations Kim, and glad to hear that you are nearly finished with it all. Here's to a wonderful and very prosperous 2016. The organisers are great. I only have two, but love the ones that I got. You got some great beauty items! I love the Kate Spade cases. I need to get some of those organizers. My collection is a hot mess right now! I love all of this Kim!! You got some good stuff! I can't wait to see your makeup room once it's done, and yay for all your renovations being done! Good luck with all the remodeling for 2016! You have some great items! I look forward to reading the Kylie reviews. Oh it looks like Santa was good to you this year Kim :) No surprise since you're such a good girl ;p The Kate Spade set is absolutely adorable! I have tired Magnolia bakery and I have to say they're a little overrated in my opinion. The frosting on their cupcakes is just too thick and sweet and a little greasy. Billy's is my better IMHO. Hope you had a splendid Christmas girl!